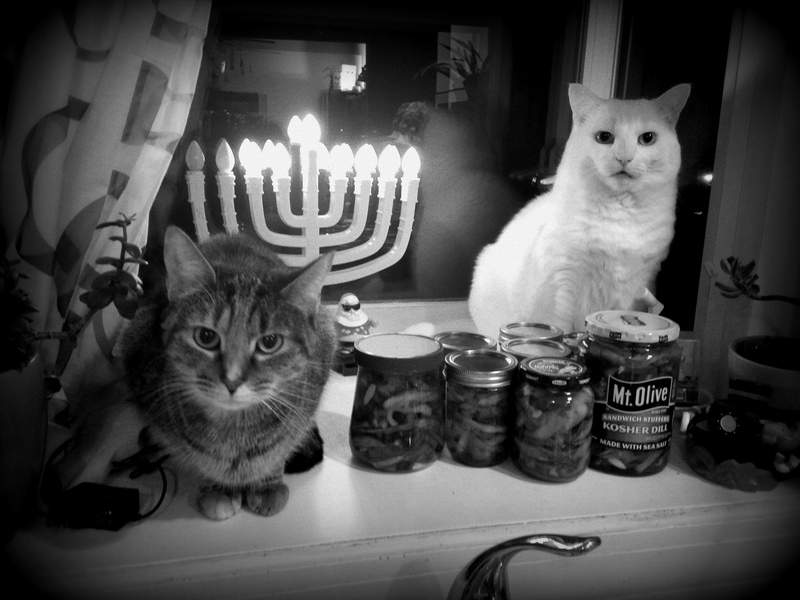 Stella and Noel in the herb window 4 or 5 years ago with Hanukkah lights and Christmas pickles. 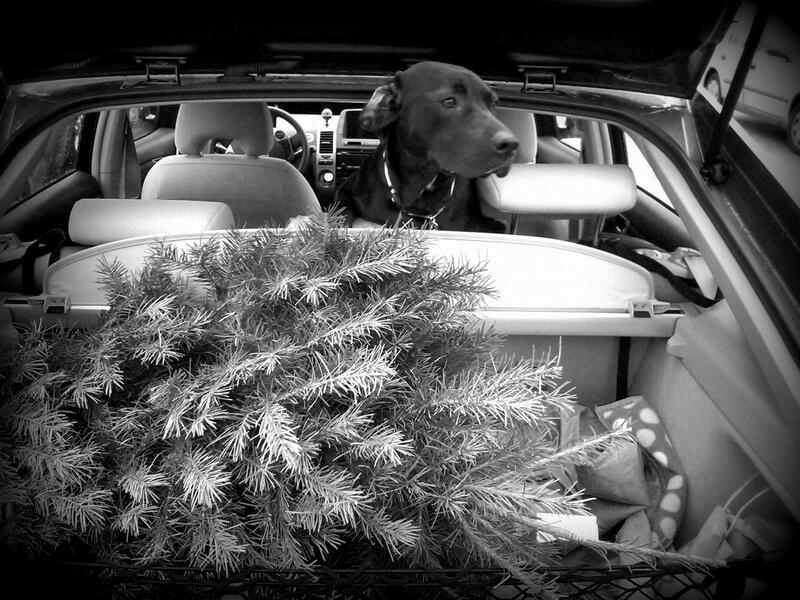 Puppy Louise, about 8 years ago, helping us select a Christmas tree. And yes, the tree actually fit in the trunk of the Prius. Tonight we celebrate the first night of the festival of Hanukkah. I bet you it was Mini Cooper who stole the gelt (candy) and the dreidel (top) from the Hanukkah table in the living room and gave them to Sofie (to get her in trouble). 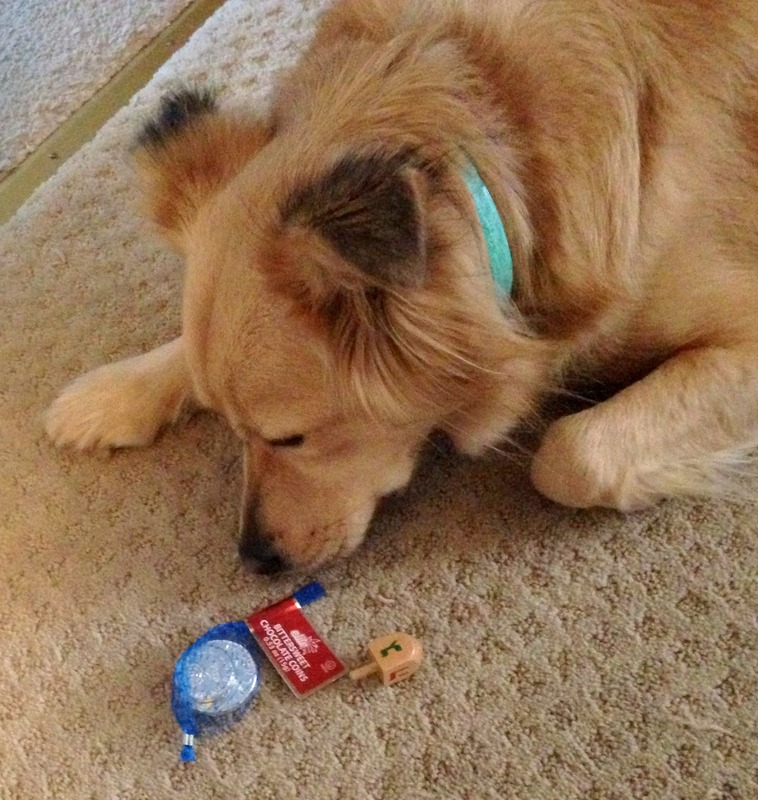 Sofie was not exactly sure what to do with these new prizes, so she brought them to me (good girl!). Dogs don’t get chocolate gelt in this house! On the first night of Hanukkah, we like to play the dreidel game. In the case of the dogs, we use bones instead of gelt. But someone seems to always spoil the game by running away with a dreidel and try to eat it. 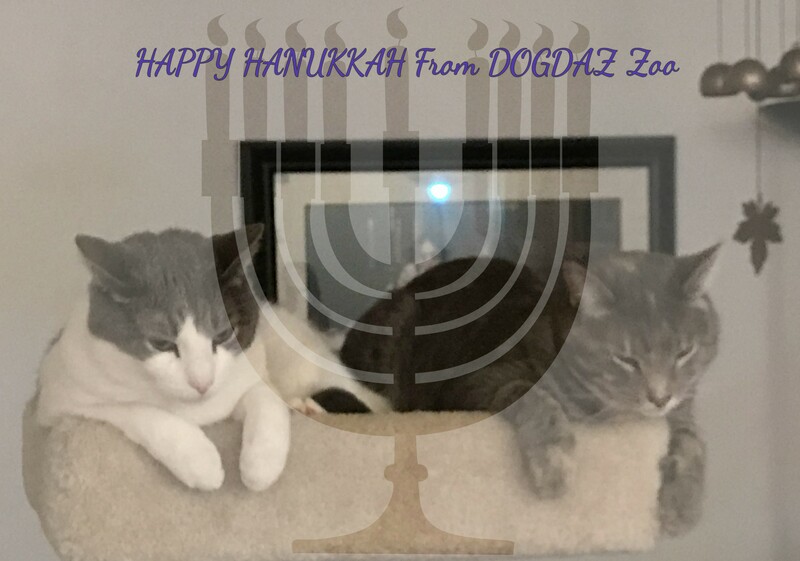 DogDaz Zoo is sending you light and love this holiday season. May each day bring you closer to your dreams. Let the holiday games begin! Wishing everyone who celebrates a wonderful season of lights and magic. That is Stella and Noel back before Stella lost her mind (2015) and decided she hated other cats. 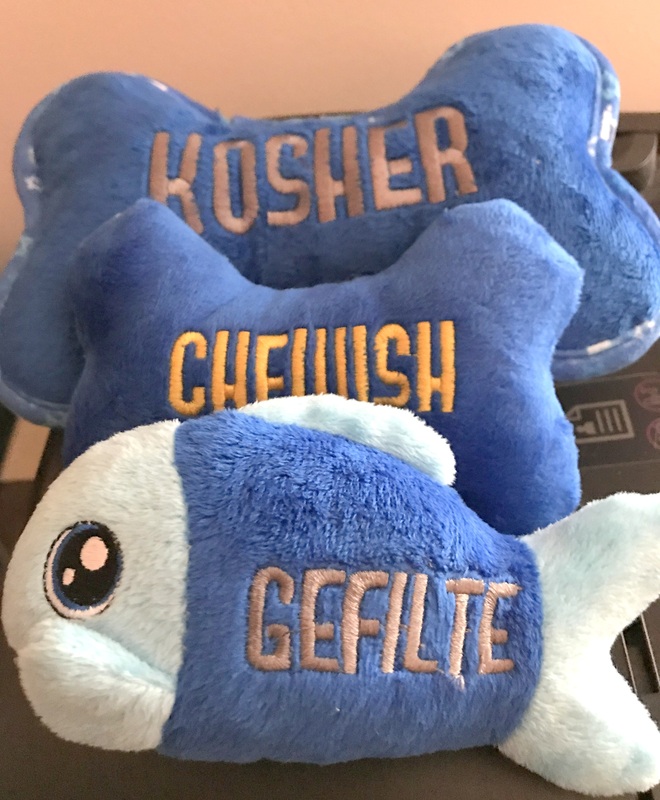 Monday Mischief: Gefilte Fish, Anyone? Mom likes when the Christmas and Hanukkah holiday days aren’t overlapping because she gets to buy us more toys. This year she could not resist getting us some very fun stuffies. She said we have to wait until tomorrow night (the first night of the holiday) before we can destroy them. Can you guess who gets which stuffy? We are still working on toys from holidays past, but Mom doesn’t care, she buys us new stuff anyway. 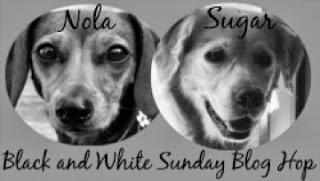 Some people would say that she spoils us, but we think we are just the luckiest rescue zoo in the universe. We can smell the latke’s cooking! Sofie wants to play dreidel (a fun Hanukkah holiday game with a special top) and stole the gelt (chocolate money – dark vegan chocolate in our house), but Mom said that is not for doggies. This picture was truly not a setup, Sofie loves to steal little things. I believed in Santa for many many years. There was never a religious connection for me when it came to Santa Claus. I figured Santa and his reindeer brought gifts to everyone, everywhere, this time of year. There is no tradition of giving gifts for Hanukkah (it is not the Jewish Christmas). But we would get one small gift and, of course, I thought it came from Santa. My biggest dilemma was figuring out how he got in the house. We did not have a fireplace, though I knew we had a chimney. Being the very bright child that I was, I figured Santa came down through the exhaust fan over the stove. Made sense to me when I was 7. Wherever your find magic in the holiday season, DogDaz Zoo, wishes you a fur filled and fabulous Caturday. My your candles burn bright (away from cat’s whiskers or tails) and your donuts be sweet. 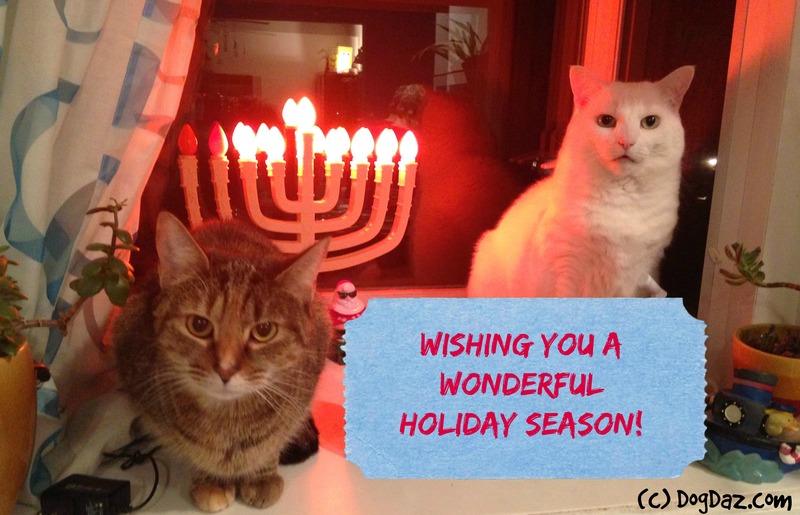 Here at DogDaz Zoo we celebrate many different seasonal holidays and tonight we celebrate Hanukkah. We enjoy the wonderful smells, tastes, and traditions of the season. I’m making potato pancakes, called Latkes, for the humans. Onion, potatoes, and lots of oil for frying. If you have not had them with apple sauce (or for you none Vegan’s, sour cream), you don’t know what you are missing. Stella and Noel are in the window with Hanukkah lights and the Christmas pickles. We run out of places to put all the holiday treats we make. Louise is a great helper when it comes to selecting a Christmas tree. And yes, we have down sized so much the tree fits in the trunk.